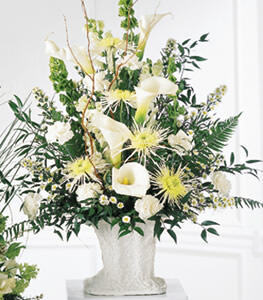 A traditional sympathy arrangement in white. This elegant arrangement features white calla lilies and white spider chrysanthemums accented with Bells of Ireland, white snapdragons, and white carnations. Appropriate to send to a home or to a funeral service.